Learn, win, and have fun at the bioenergy carnival! The whole family is welcome! That’s how the AHB Extension team promoted the Bioenergy Carnival, held November 5th at the Snohomish County Extension Office in Everett, WA. Despite winter weather conditions and a Seattle Seahawks game, we had a great turnout. Seventy-five people, including volunteers and hosts, joined us for the carnival, and it was indeed fun and educational for all. At the “Energy from Movement” station, guests learned how movement in nature, like wind blowing or streams flowing, can generate electricity. Hand-crank flashlights let kids see this principle in action by using their own movements to power the light. 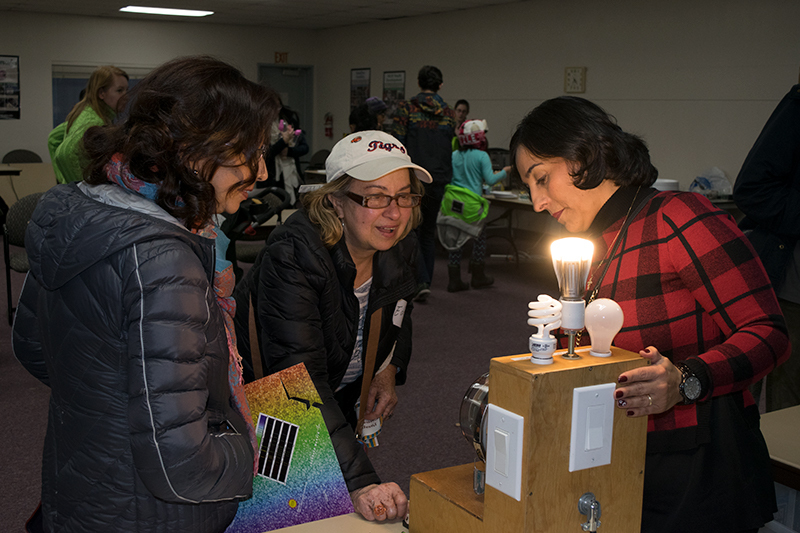 Extension associate Tatiana Giraldo (right) teaches guests about home energy efficiency using a light-bulb meter, courtesy of Snohomish County PUD. The slower the meter spins, the more efficient the bulb! 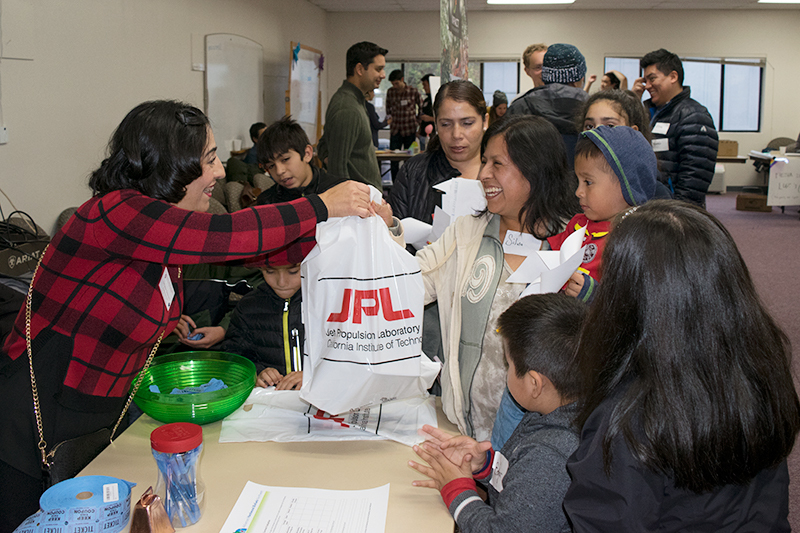 The Bioenergy Carnival provided Latino families with a chance to learn together through hands-on activities and science demonstrations, with the aid of bilingual volunteers. The central theme was energy and the environment. Lessons covered energy efficiency, wind/hydro/solar power, biofuels, wood energy, and food waste for energy. 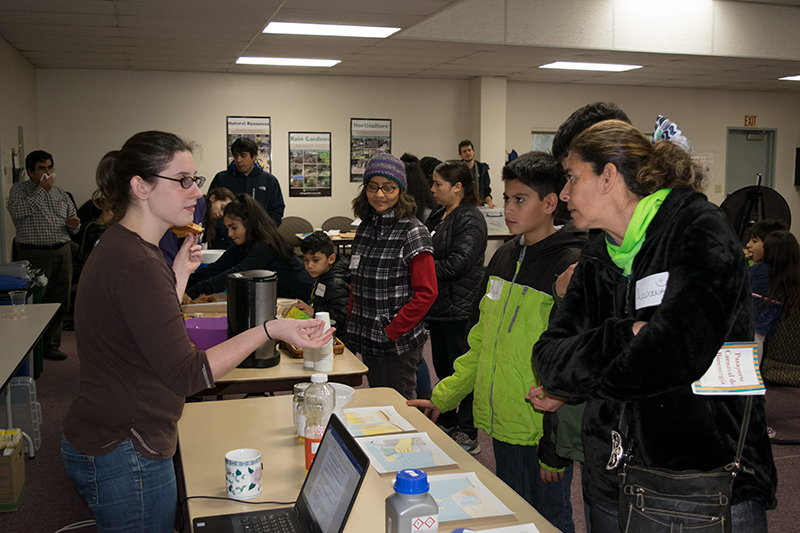 Visitors raced solar cars, built pinwheels, mixed liquids and yeast to test for sugar content, poured water over a model waterwheel, spun a question wheel, compared energy usage of different light bulbs, and more. 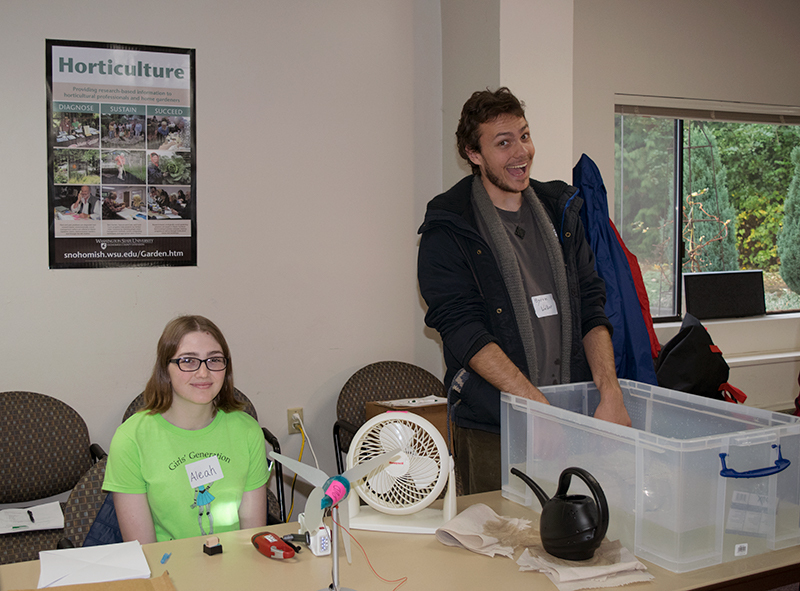 University of Washington student volunteers from the Northwest Earth and Space Sciences Pipeline (NESSP) use spectometers to teach about how leaves captures light, which plants need to create useable energy – sugar! 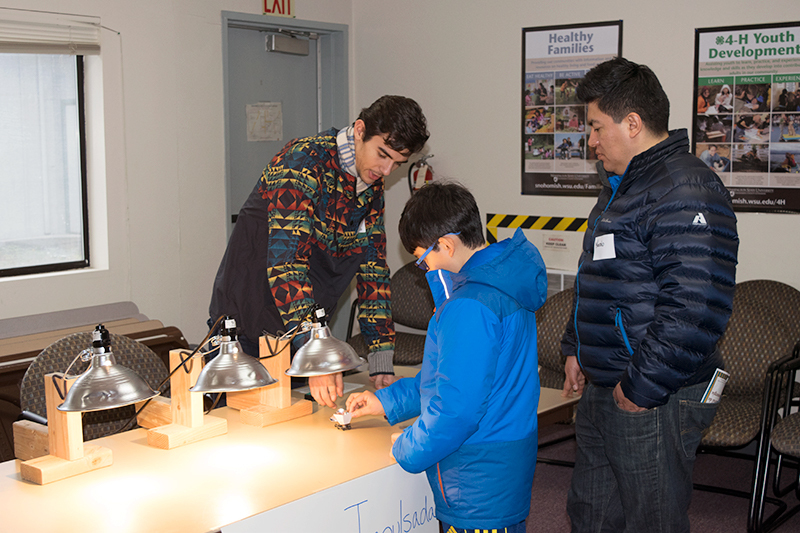 At the solar energy station, guests experimented with toy solar cars with help from an NESSP volunteer. Cat Gowan (left), Extension Coordinator, discusses how biodiesel is made. To make things even more exciting, we held a raffle. 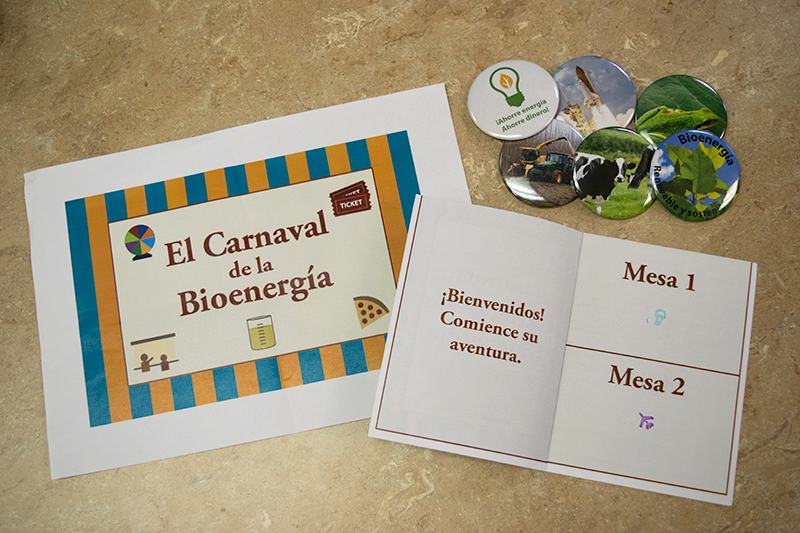 To earn tickets, families collected stamps in their “Pasaporte Carnival de Bioenergía” at stations around the room. Winners went home with energy efficient prizes like LED lightbulbs and low-flow showerheads. Families collected stamps in a Bioenergy Carnival Passport to earn raffle tickets, and everyone went home with a button from the “Spin the Wheel” station. A raffle-winning family receives their prize. 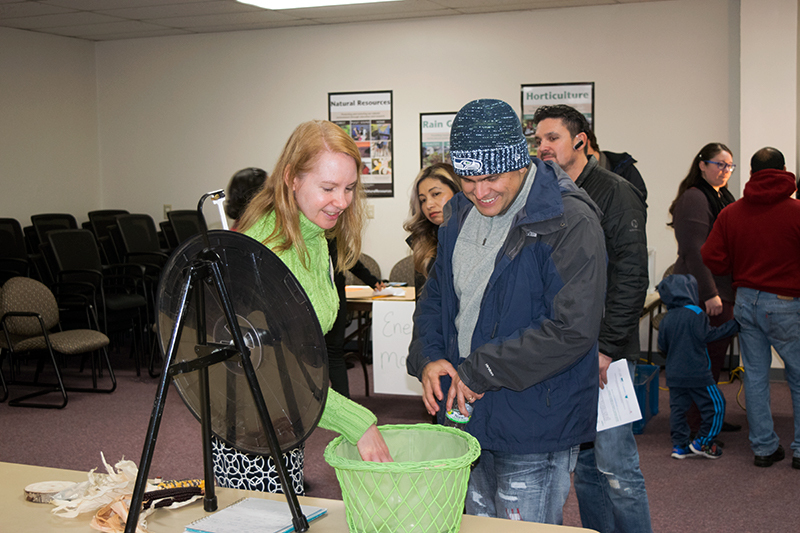 Patricia Townsend (left), Regional Extension Specialist, runs the “Spin the Wheel, Answer a Question” station, where visitors learn about a specific energy topic based on where the wheel lands. Everyone wins a button for playing. We were fortunate to collaborate with multiple organizations for the carnival. Our primary co-sponsor was the Northwest Earth and Space Sciences Pipeline (NESSP). 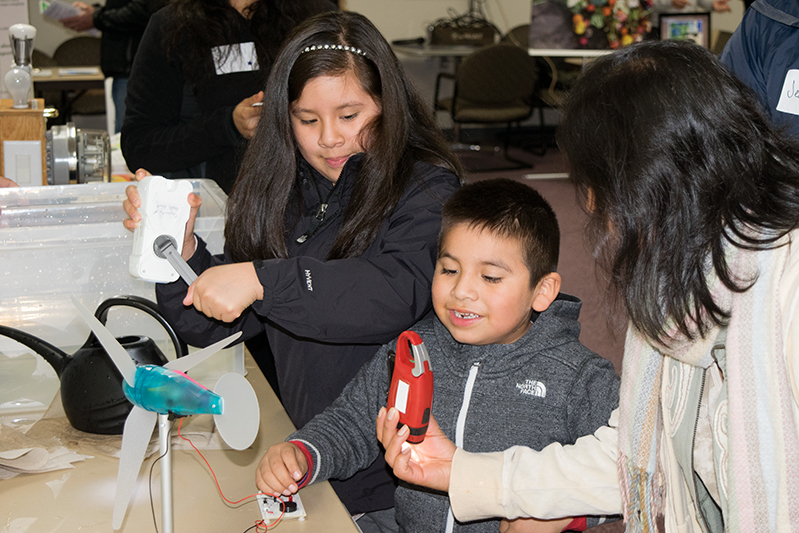 As a “virtual NASA center,” through Washington NASA Space Grant Consortium at the University of Washington (UW), NESSP strengthens science, technology, engineering, and mathematics (STEM) education in underserved and underrepresented communities. UW student volunteers from NESSP ran multiple stations, helped with set-up, and brought enthusiasm and excitement. 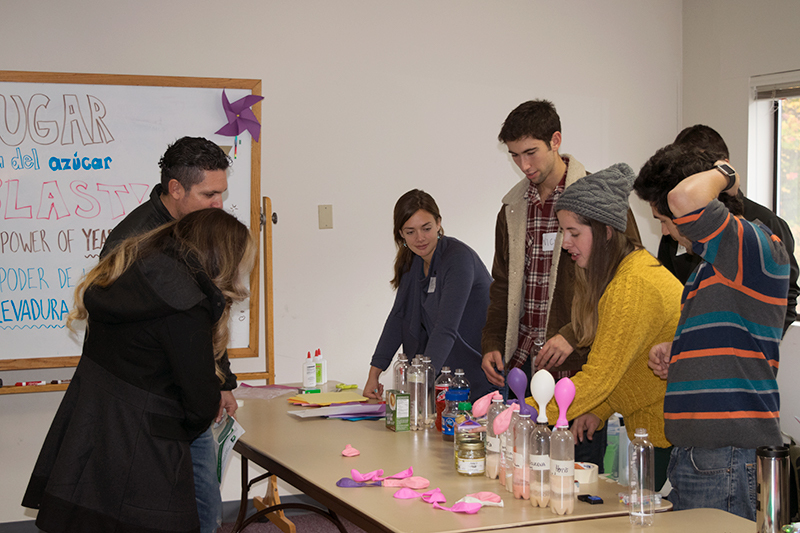 NESSP volunteers ran a fermentation experimentation station. Guests tested different liquids, like soda pop, for relative sugar content. A bigger balloon means higher sugar content because the yeast has more to ferment and therefore creates more gas. Two NESSP volunteers lead demonstrations at the Movement to Energy station and seemed to have as much fun as the kids playing in the tabletop wave tank, pouring water over a waterwheel, and using a fan to create wind for the mini turbine. 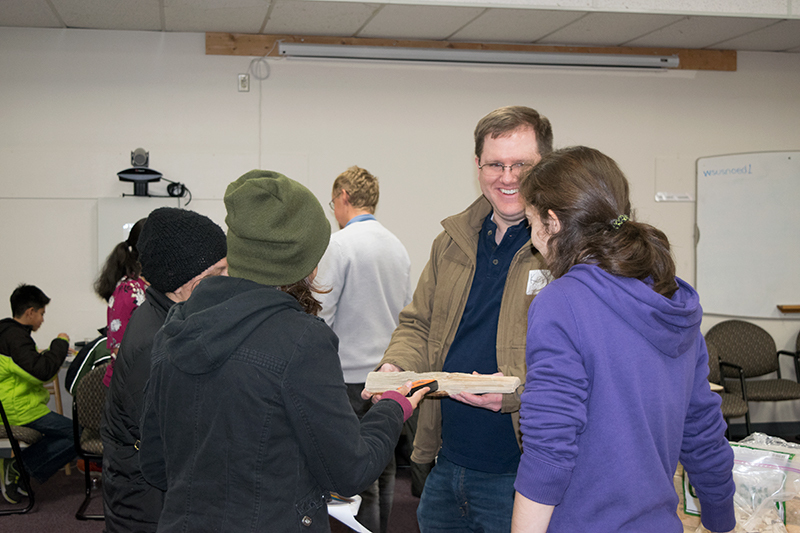 Isabel Carrera Zamanillo, NESSP outreach specialist (right), and Kevin Zobrist, WSU Extension Forestry (holding firewood), use a moisture meter to show how to test that firewood is dry enough to burn cleanly, safely, and efficiently. No more than 20% is the goal! Impact Bioenergy, represented by Srirup Kumar and Ed ?? ?, shares about the company’s food waste generators, which are helping communities reduce their environmental footprint by using food waste to produce energy. This provided a tangible example of a bioenergy solution in action! 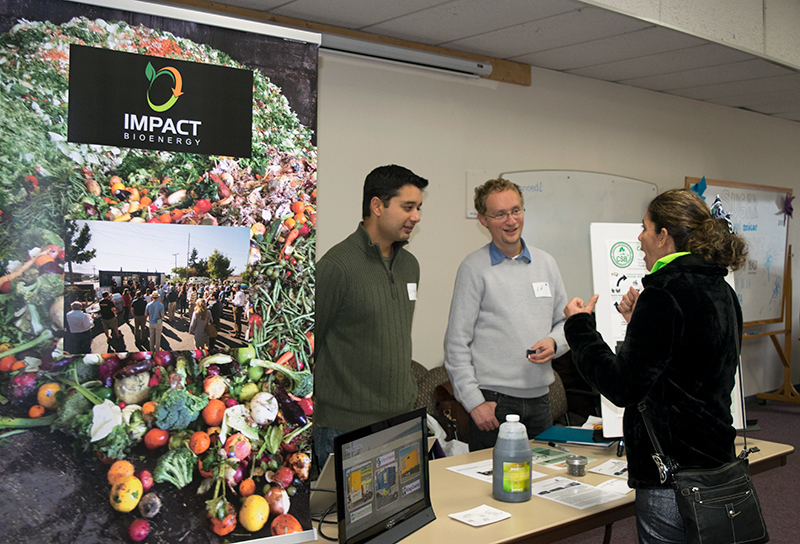 In addition to volunteers from NESSP, we also had volunteers from WSU Extension Snohomish County’s Promotores program and representatives of Impact Bioenergy, a company that builds community-scale systems to turn food waste to energy. 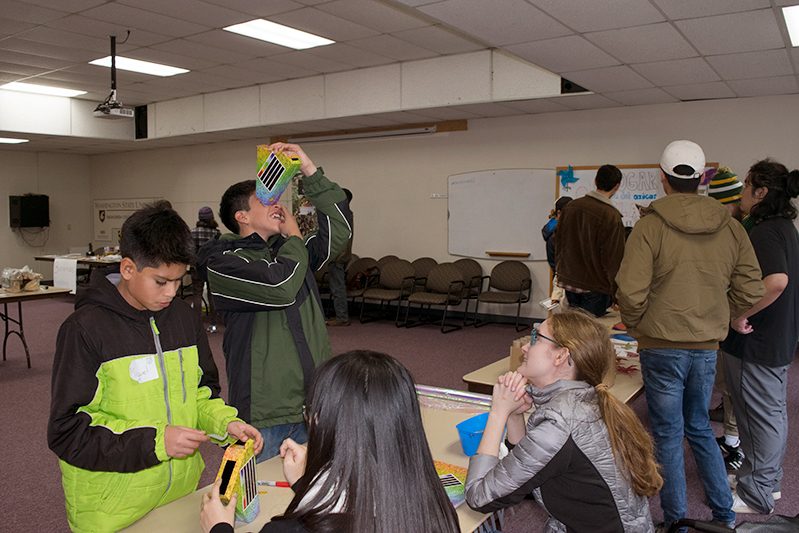 Snohomish County PUD provided educational display materials, like a meter box and a miniature wind turbine. Bonneville Power Administration sent brochures, pens, and coloring books to give away. Thank you to our volunteers, sponsors, and visitors alike! And for those who would have otherwise been watching the Seahawks, it may have turned out for the best given the final score. Interested in having a similar event hosted in your community or for your organization? Please let us know! We are looking for ideas of places to hold another Bioenergy Carnival this coming spring or summer. Email noelle.hart@wsu.edu. A homemade rocket stove heats a tea kettle to stimulate conversation about an ancient source of energy for heating and cooking – burning biomass. On a related note, we demonstrated another way to use poplar for bioenergy (if you look closely, those are poplar cuttings in the stove).